For an excellent Directory of Faires listed by state, Click Here! Please send suggestions, comments and corrections regarding this Time-Area to: . For more information regarding individual groups, please contact them directly. All of the following concentrate on living history except where noted. As you may have guessed, there are an immense number of books on the middle ages. Here are a few. If you don't find what you're looking for here, go to Amazon.com and do a search. Remember, if you link to Amazon through us and order online, we get a small percentage, at no extra cost to you -- this will help keep Reenactor.Net online! You might find book reviews on the following books on their pages at Amazon.com. If you would like to review a book, please submit your review to Amazon.com; if you would like to add a few clarifying words to my descriptions, please email me. I took most of the descriptions for these books right from the Amazon.com pages. Really love or hate a book listed here? Want to add your favorites? Thought of a much better way for me to organize these? Please send suggestions, comments and corrections regarding this Time-Area to: . A note: if you use Earthlink, AOL or probably MSN as your ISP, they sometimes have "pop-up" ads blocked (a good thing) but it also can mess up our book links to amazon.com. If you are experiencing this problem, please contact your ISP and ask THEM how to correct this... we don't know how. The Civilization of the Middle Ages -- Norman F. Cantor -- Cantor has rewritten about a third of his 1963 classic overview of the Middle Ages in Europe. The new edition incorporates recent research and gives more attention to topics that have become of more concern, such as women's experience, family history, piety and heresy. It will probably remain the standard undergraduate text for many years. Acidic paper. Arms and Armour in Antiquity and the Middle Ages (Medieval Military Library) -- Charles Boutell, M. P. Lacombe (Translator) -- Numerous illustrations, many from sources now lost, back up a detailed discussion of world-wide developments in armor from the earliest times, and weapons from the Stone Age to early firearms and cannon. An Historical Guide to Arms & Armor -- Stephen Bull, Tony North (Editor) -- Bull, English Civil War historian and museum curator, has compiled an evolutionary history of small arms (swords, knives, pistols, and rifles) and armor (helmets and body armor) beginning with the Greco-Roman world and ending with the advent of World War I. The history is supported with over 300 photographs, mostly from works of art and individual pieces in European art museums. The text is authoritative and exhaustive, the first such work on this topic in a century. Some coverage is excellent, the best this reviewer has seen on European arms; there is excellent coverage of helmet evolution and on arms development in the Indian subcontinent. Some coverage is weak, especially on Japanese small arms and the American Civil War. Using this volume as a verbal text to the recently reprinted Weapons (Diagram Group), large libraries would possess the two finest reference works on the history of small arms. This is highly recommended for central branch libraries and academic libraries. Weapons : An International Encyclopedia from 5000 B.C. to 2000 A.D. -- Diagram Group -- This comprehensive survey of the history of weapons traces the evolution of arms, including specifications, from clubs to tomorrow's sophisticated technologies, placing weapons in the context of their time. From primitive flint axes to nuclear and biological warfare, Weapons is the most comprehensive one-volume reference to the history of weaponry. Drawing from museums and private collections, this updated edition describes the exact specifications of each piece and places all weapons in the context of their utilization in particular wars and campaigns. 2,500 illustrations. The Book of the Sword -- by Richard Francis Burton -- Eloquent, exceptionally erudite history of the "Queen of Weapons." Traces sword's origin -- from prehistory to its full growth during early Roman Empire. Discusses earliest weapons of stone, bone, horn and wood as well as variations: sabre, broadsword, cutlass, scimitar and more. Enhanced by nearly 300 excellent line drawings. The Encyclopedia of the Sword -- Nick Evangelista, William M. Gaugler (Foreword) -- From the gruff, sword-toting swashbucklers of the Middle Ages to modern adventure epics like The Princess Bride, the aura surrounding the sword is one that is both romantic and pragmatic. Thoughts of this weapon bring to mind images of the Knights of the Round Table, Zorro, the Three Musketeers--the things daydreams are made of. Yet, until the publication of this encyclopedia there has never been a comprehensive volume on the subject of the sword. For the first time, readers can locate information on the history of sword types and styles throughout the world, techniques of combat sword use, techniques of fencing and major fencing masters, and so on. David C. Nicolle, in this second volume of his comprehensive study of military weapons and equipment examines the arms and armor actually used by Moslem, Orthodox Christian and Mongol armies. Emphasising the evolution of military technology, fashion and science, this definitive study throws light on Eastern Europe and Asia as old empires decay and new powers emerge. 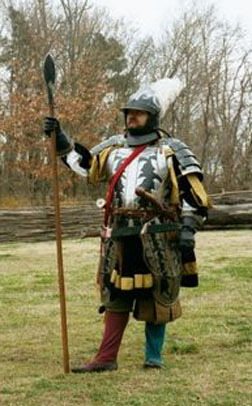 Arms and Armour of the Crusading Era examines the arms and equipment for each specific power or ethnic group. Conclusions are then linked to hundreds of superbly detailed line drawings based on archaeological evidence, iconography and contemporary accounts. Arms and Armor : The Cleveland Museum of Art -- Stephen N. Fliegel -- Illustrated with examples of helmets, shields, swords, crossbows, firearms and other items from the collection of the Cleveland Museum of Art, this volume traces the history of European arms and armour from antiquity to the 18th century. It explores themes such as medieval warfare, tournaments, the process of making and decorating armour, and the Renaissance culture of arms. There is also discussion of various forms of weapons, and the illustrations include paintings, tapestries and engravings which show how the objects were used and worn. A Sip Through Time - A Collection of Old Brewing Recipes -- Cindy Renfrow; Includes recipes. Would you like to Revel with Athenaeus in a Greek symposium? Imbibe Pliny the Elder's wines and hydromel? Toast the night away with the Menagier of Paris' hypocras? Partake of the mead drunk by Queen Elizabeth I? Delight and impress your friends with an almost endless repertoire of beverages enjoyed by such famous historical figures as Apicius, Sir Kenelme Digby, Ben Franklin, William Penn, and George Washington? NOW YOU CAN! ANNOUNCING! A Sip Through Time, A Collection of Old Brewing Recipes. A single illustrated volume containing over 400 documented historical recipes for ale, beer, mead, metheglin, cider, perry, brandy, liqueurs, distilled waters, hypocras, wines, etc., dating from 1800 B.C. to modern times. Brewing Mead: Wassail! In Mazers of Mead -- Robert Gayre, Charles Papazian (Contributor) -- Mead, an ancient honey-based brew, is without doubt the most intriguing of all fermentables. Some brewers say that its dry Champagne or sweet, smooth, fine-wine taste is the best. For centuries, mead has been the drink of European royalty. It is reputed to be a powerful aphrodisiac. Now you have the opportunity to make some yourself and see. Brewing Mead provides step-by-step recipes for making this tantalising delight. Charlie Papazian shows exactly how ordinary homebrew equipment and ingredients can be used to brew several types of mouth-watering mead. Robert Gayre traces the history of this ancient brew from its roots in mythology, as the liquor of Greek gods, throughout Europe, where it was the forefather of ale and beer as we know them. The Art of Cookery in the Middle Ages -- Terence Scully -- A compendium on practically all aspects of the art of cooking and dining... Because of the author's familiarity with all aspects of the subject we are offered this rara avis: a book which interests the specialist and the general reader; which allies common sense with scholarship; and which presents the theory and practice of medieval cooking for the scholar and the practitioner... has its place on the shelves of the practical cook as well as on those of the scholar: both can feed on it! The master cook who worked in the noble kitchens of the fourteenth and fifteenth centuries had to be both practical andknowledgeable. His apprenticeship acquainted him with a range of culinary skills and a wide repertoire of seasonal dishes, but he was also required to understand the inherent qualities of the foodstuffs he handled, as determined by contemporary medical theories, and to know the lean-day strictures of the Church. Research in original manuscript sources makes this a fascinating and authoritative study where little hard fact had previously existed. The Medieval Kitchen : Recipes from France and Italy -- Odile Redon, Francoise Sabban, Silvano Serventi, Edward Schneider, Franp Sabban (Compiler); Includes recipes. Pleyn Delit : Medieval Cookery for Modern Cooks -- Constance B. Hieatt, Sharon Butler (Contributor), Brenda M. Hosington (Contributor); Includes recipes. Fabulous Feasts : Medieval Cookery and Ceremony -- Madeleine Pelner. Cosman, Madeline Pelner Cosman; Includes recipes. Take a Thousand Eggs or More (Second Edition/2 Volumes) -- Cindy M. Renfrow; Both volumes include medieval recipes; first includes modern translation. The 13th Warrior (previously published as Eaters of the Dead) -- Michael Crichton; a merging of the writings of Ahmed ibn Fadlan, an Arab who traveled through Europe, and the poem Beowulf, with a twist. Set in the 10th century. King Hereafter: A Novel -- Dorothy Dunnett; based on Macbeth, in 11th-century Scotland. A Guide to Old English -- Bruce Mitchell; Grammar textbook. Beowulf and the Fight at Finnsburgh -- Friedrich Klaeber; Beowulf plus the Finnsburgh fragment in Old English with a glossary to help you translate the text. On back-order at Amazon.com but worth the wait - a must for any Old-English scholar. An Introduction to Old Irish -- R.P.M. Lehmann, W.P. Lehmann; text in Old Irish with a glossary to help you translate. It's the best one out there... wait, it's the only one out there. Irish Grammar: A Basic Handbook -- Noel McGonagle; keep in mind this is for modern Irish. Beowulf: A Dual-Language Edition -- Howell D. Chickering (editor); a good translation of Beowulf with Old English and Modern English text lined up for comparison. Idylls of the King (Penguin Classic) -- Alfred, Lord Tennyson, J.M. Gray (editor); poetic tales of King Arthur & the Knights of the Round Table. Arthurian Romances (Penguin Classies) -- Chretien De Troyes, William W. Kibler (designer), Carleton W. Carroll (translator); originally in Old French in verse form; includes Perceval, Erec & Enide, Cligs, Lancelot, and Yvain. The Tain, Translated from the Irish Epic 'Tain Bo Cuailgne' -- Thomas Kinsella (translator), Louis le Brocquy (illustrator); Ulster Cycle tales of CuChulainn. Early Irish Myths & Sagas -- Jeffrey Gantz (editor & translator); the Ulster Cycle. Nibelungenlied -- A.T. Hatto (translator); the tale of Siegfried's death and Kreimhild's revenge. Parzival (Penguin Classics) -- Wolfram von Eschenbach, A.T. Hatto (translator) early 13th century re-telling of the Welsh Perceval. Tristan -- Gottfried von Strassburg, A.T. Hatto (translator); with a glossary of names. Edda (Everyman Paperback Classics) -- Snorri Sturluson, Anthony Faulkes (translator); the complete Prose Edda, compiled by Snorri Sturluson as a textbook for poets; "the most complete catalog in existence of the mythology of pagan Scandinavia." The Poetic Edda -- Edda Saemundar, Lee Milton Hollander (translator); some reviewers have said Hollander sacrifices accuracy but tells a good story, and that it is hard to tell what is original and what is Hollander's. However, this book is often used in universities. Norse Myths -- Kevin Crossley-Holland; "retold" Norse myths, with glossary of names (not a direct translation). Egil's Saga -- Snorri Sturluson, Hermann Palsson (translator), Paul Edwards (translator); 10th century Icelandic tales. Eyrbyggja Saga -- Hermann Palsson (editor), Paul Edwards (translator); 10th-11th century tales of the settlement of Iceland from Norway, and supernatural tales. Njal's Saga -- Magnus Magnusson, Hermann Palsson (translator); Icelandic tales. Laxdaela Saga -- Magnus Magnusson; Icelandic tales. Vinland Sagas: Norse Discovery of America -- Magnus Magnusson (editor); contains Graenlendinga Saga and Eirik's Saga, two accounts of discovering America. The Saga of the Volsungs: The Norse Epic of Sigurd the Dragon Slayer -- Jesse L. Byock (editor); Icelandic, written in the 13th century, based on Old Scandinavian legends. Companion to Medieval and Renaissance Music -- Tess Knighton (editor), David Fallows (editor); collection of essays, includes glossary and chronology. Music in the Renaissance -- Howard Mayer Brown, Louise K. Stein; "An overview of music in the 15th and 16th centuries, with emphasis on the contributions of the greatest composers." The Anglo-Saxons (Penguin History) -- James Campbell (editor), Eric John, Patrick Wormald; history of the Anglo-Saxons, with a bibliography (up to 1981). Note: These aren't just for kids! "Kids" books usually have useful pictures. Please send suggestions, comments and corrections regarding this Time-Area to:. For more information regarding individual groups, please contact them directly.